Here's an Ocean State Company That's Really Making Splash! Nestled between North Providence, Johnston, and Pawtucket is Centredale; the soda capital of Rhode Island. Home to a truly effervescent company since 1915, the Yacht Club Bottling Works has quietly been building it’s brand and growing the popularity of its unique line of regular and diet sodas for Rhode Island and it’s local environs. Yacht Club uses only glass bottles for carbonated drinks. No plastic, no aluminum cans, only glass because it keeps the contents fresh and pure unlike any other container. Only returnable glass bottles are used, which can be exchanged for a credit. All bottles returned are sterilized then reused. (Reuse is the best form of recycling). Every bottle returned saves enough energy to power a standard light bulb for 100 hours. Last year alone, with the Think Green Save the Bottles Campaign, Yacht Club reused over 5,000 cases (120,000+ bottles) keeping them out of our local landfill. 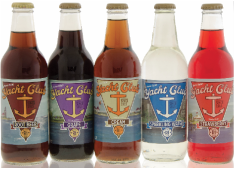 A family owned and operated local manufacturer, Yacht Club opened with the goal of bringing a premium quality beverage to Rhode Island. Our flavorful sodas begin with pure, natural water from an artesian well drilled through the bedrock 180 ft below the building. The water is natural mineral water and has exceptional characteristics for carbonation. Its natural temperature is 45 degrees, which allows carbonation without the use of cooling towers that can be bad for the environment. Also, the water naturally accepts 5.5 volumes of carbonation without alteration. This means NO SALT ADDED for carbonation. All of our syrups are made onsite with only extra fine granular pure cane sugar mixed with natural artesian water - Never High Fructose Corn Syrup! No fifteen-letter chemicals and preservatives that you can’t pronounce or would care to swallow. Even though pure cane sugar is triple the cost of HFCS, it is well worth it. When our syrup is fully mixed, the finest extracts and flavorings are added to make a truly unique drink. Yacht Club also offers a large selection of sugar free options including diet soda and naturally flavored sparkling water. You will notice when you drink a Yacht Club Soda that it is clean, smooth and genuinely refreshing. Getting thirsty? Where can you find Yacht Club Sodas?